Flamingo Travel Vietnam motorbike rentals / tours Provide 24/7 roadside assistance, English speaking mechanics, expert travel guides and a personal service, we treat our customers as we would wish to be treated ourselves. Our Hanoi and Ho Chi Minh branches allow you to easily pick up and drop off your motorbike at either location, as well as at key points outside the city; for carefree convenience whilst exploring Vietnam. Flamingo Travel Vietnam motorbike rentals / tours always puts customer safety first. We stock a full range of riding equipment and gear. For extra peace of mind our motorbikes are also fully-maintained using only authentic parts. As well as the right equipment, you can be sure of a carefree service; with fast and reliable 24 hour support and assistance throughout your motorbike rental and motorbike tour. Topped off by optional motorbike lessons and more, Flamingo Travel puts you in the hot seat for a safe and enjoyable motor biking experience! Our well-established Garage in Hanoi maintains and repairs our extensive fleet of motorbikes and is on hand to offer you a first rate service; with friendly English-speaking mechanics waiting to assist you. Top quality customer service – our Mechanics are on call and will be happy to come to you and deliver/pick up your rental motorbike or check it and fix it in the event of a mechanical fault. 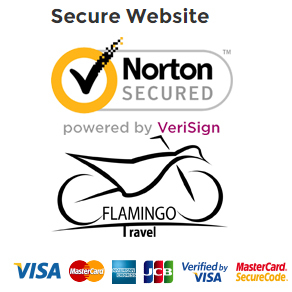 Flamingo Travel Vietnam motorbike rentals / tours understands the need for flexibility whilst abroad, which is why we offer payment options to suit.